Today we introduced a morning meal into the solid food schedule. 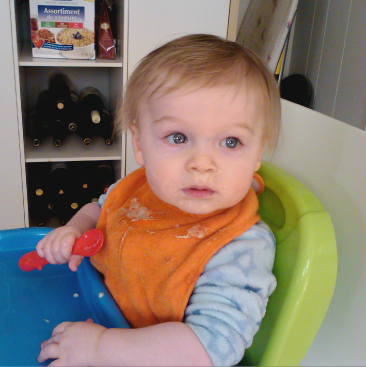 I started with dinner at six months, added lunch at seven months & breakfast at eight. We're going to have to really be on top of things with three meals a day to feed him, on top of five to six breastfeeds plus a bottle or two top-up. I kinda feel like all I do is feed him--I suspect it's going to add up to about four or five hours a day with breakfast in there. Just feeding this kid is a part-time job, to say nothing of preparing meals & cleaning him up afterward.